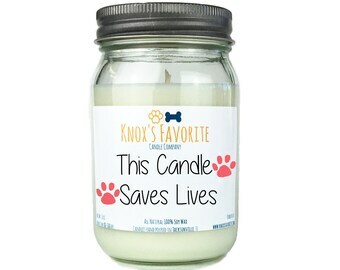 Helping dogs is our mission, so what better way to demonstrate that than this candle! Choose from any of scents we offer with the drop down menu. Depending on the scent you choose, the color of the candle will change. The label however will not unless specifically requested. For more information on the scents and colors, view our other listings and if you have any questions, please feel free to ask. 9 oz. Candle Approximate Burn Time approx. 40-60 hours. 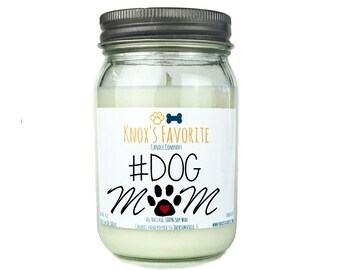 We are the premiere dog lover candle company. Whether buying for yourself, or as a gift, rest assured that you are making the right choice. 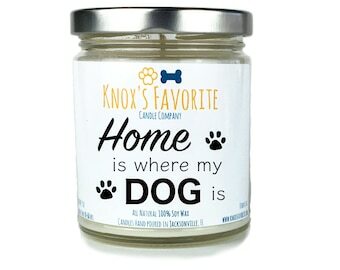 Our handmade, all natural, scented soy wax candles are made from premium products and a portion of the profits are used to help dogs in need across the country. 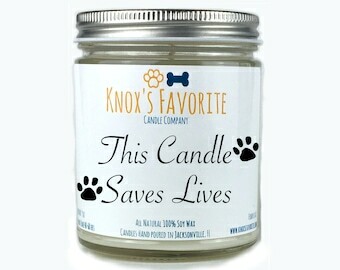 Our candles are hand poured in Jacksonville, FL. 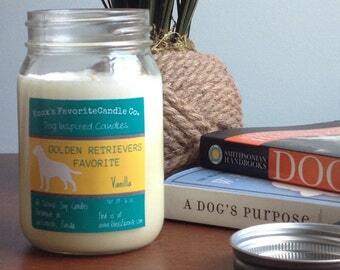 We use only the best, environmentally friendly, soy wax, made from soybeans grown in the U.S.A by American farmers. Soy wax is a better option than paraffin wax for many reasons. Soy wax burns cooler, allowing candles to last almost twice as long as paraffin wax candles. Soy wax has better hot and cold scent throws, allowing you to smell a candle throughout a room or house. Because soy wax is a vegetable oil base, as opposed to a petroleum oil base, soy wax candles do not emit CO2 into the atmosphere, and the Jars can be cleaned with mild soap and water. 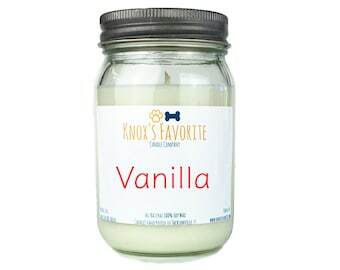 Soy wax candles also burn cleaner because of this, and do not accumulate the soot buildup that paraffin wax candles do. We use cotton core wicks because they are lead and zinc free making them a healthier alternative to traditional wicks. These wicks burn just as well, are easier to trim, and don't have any of the negative side effects of wicks fortified with metals. Our candles are poured in small batches right in our kitchen. Because of this, the colors may be slightly different from batch to batch. Don't worry though! 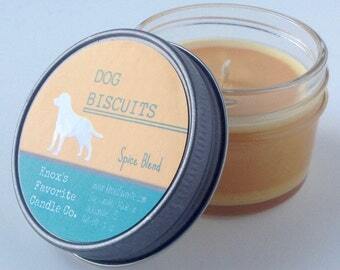 All candles are approved by our head product sniffer (Knox) before being shipped. We make candles so we can give back to those in need. It's as simple as that. 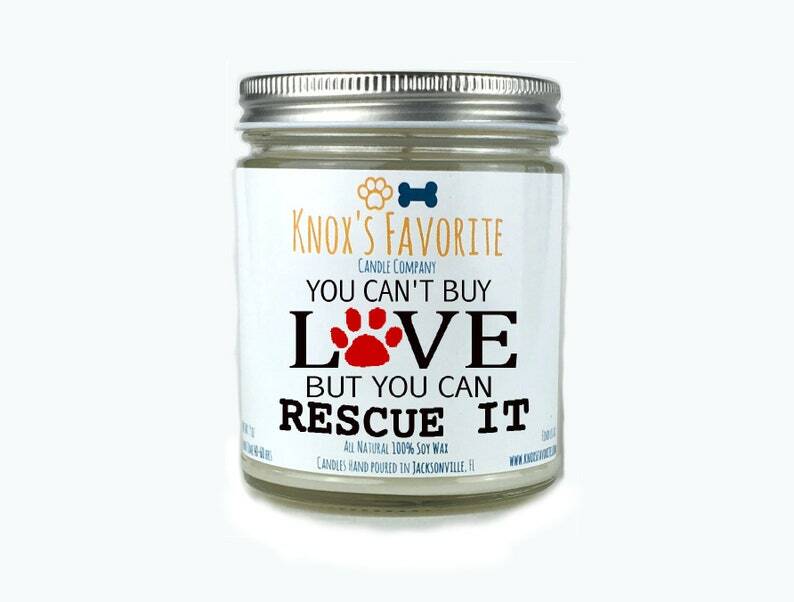 We are committed to helping all of our fur friends by donating 10% of our profits to a variety of Animal Shelters and Rescues across the country. Every dog deserves to be taken care of and it is our mission to help ensure that happens. Your purchase goes a long way towards helping dogs everywhere get food and shelter while they wait to find their Fur-ever home. 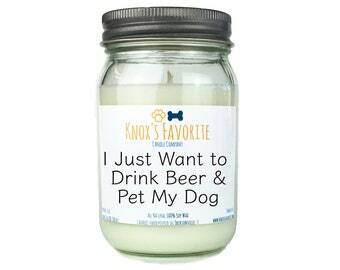 We recommend that you trim the wick to ¼ in. each time before lighting the candle, and allowing a full melt pool to form each time before extinguishing to eliminate tunneling. Soy wax has a memory, and because of this, it is very important to allow a full melt pool to form the first time you light the candle. A full wax pool is achieved by allowing the wax to melt all the way to the edges of the container, and about 1/2 inch deep. If you do not allow a full melt pool to form the first time you light the candle, subsequent burns won't extend past the original melt and the candle will tunnel. 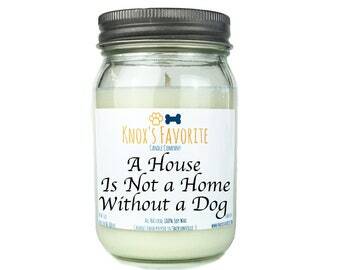 As a pre-caution, never leave a room when a candle is burning and be careful when moving the jar as it is hot when lit. Our jars are made of glass, which allows them to be recycled (and up-cycled!). They can however break if dropped or allowed to get too hot. Never leave a candle lit for more than four hours at a time. All of our candles ship as economically as possible, which turns out to be USPS flat rate shipping boxes in the US. We fit as many candles in a box as we can. 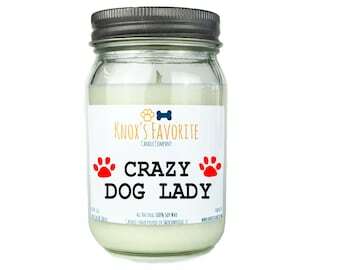 If you buy multiple candles, please pay attention to the shipping costs, as it is advantageous to buy multiple candles at a time. Tracking information will be provided and all shipments will be insured. If an item arrives broken, please send us pictures of it, as we will need to provide them to USPS as proof. We have no way of knowing what happens to your order once USPS picks them up. Please be patient and courteous and allow the applicable time for us to process a claim if need be. We want to thank you for taking the time to view our items. We pour (pun intended!) our hearts into each candle we make and it means so much that you have taken the time to view them. If you have any questions, please don't hesitate to ask. We love to hear feedback from the Etsy community, even if they don't end up purchasing one of our products. We offer custom labeling and can be pretty flexible with bulk orders for special events. Again, we'd love to hear from you for any reason. 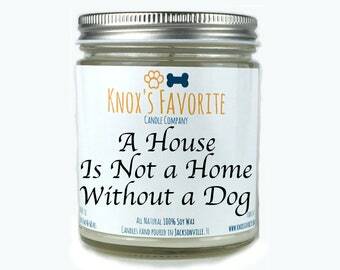 We thank you so much for visiting our store and hope that you enjoy our candles as much as Knox does! Super quick shipping, and great communication. 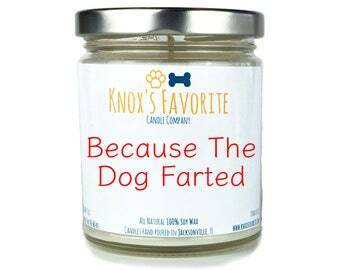 It was a gift for my friends who recently adopted a rescue dog, and the husband would love the humor; I haven't seen them in a while and wanted to surprise them; they loved this! It was perfect for them. Thank you so much. Thanks for the VERY quick shipping. Great service!